In this guide, we will present to you the best fishing SUP available right now. Our list of the best fishing SUPs includes inflatable / solid boards under $1,500, under $1,000 and under $500 so you can be sure to find the right SUP for your needs and budget. Without any further ado, here are the best fishing SUPs that you can buy in 2018. A fishing SUP provides the unique advantage of being able to easily and cheaply get you on the water. It also provides a great vantage point with a higher line of sight than you would normally have when fishing from a boat in a sitting position. With all the different fishing SUP boards available today and the variety of price and features, it can be difficult to choose the right fishing SUP for your budget and specific needs. We are experts in SUPs and have researched all the latest and greatest boards to help you select the best of the best. 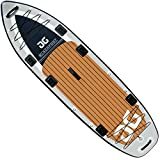 We have reviewed 10 of the best fishing stand up paddle boards based on Amazon customer reviews, our own experience and testing of the equipment. You can comfortable select one of the fishing SUPs listed above (and in detail below) as you will have experts backing your choice. We will endeavour to keep this article updated every month to reflect the latest additions to the fishing stand up paddle boards market. The new 12 foot “Cross Fish” BIC SUP is a larger version of the award-winning 10 and 11 foot versions. The additional lengths provides some key advantages for the keen fisherman including increased stability, versatility, higher capacity (suitable for up to 350 lbs) plus more space to comfortably stow all your fishing gear. It has been further enhanced for fishing with the addition of three integrated tracks which are optimally positioned for fishing accessories, and a full-length deck pad. While the solid design of this board makes it heavier than the inflatable SUPs reviewed here, we found it was fairly easy to paddle due to the unique keeled nose feature which helps the board to track accurately. In summary, if you are looking for a well manufactured board which offers great stability and is specifically designed for fishing then the BIC SUP is a great option for you. The Imagine Angler SUP is a high-end inflatable fishing SUP which offers great stability from a board which can be easily stowed and transported. The super stability is largely due to the design and 38″ width of the board which also provides more deck space. This SUP is packed full of fishing-specific features including universal mounting plates for fishing rod holders, forward and aft cargo bungees for securely storing fishing gear and a kick-up skeg fin which allows you to fish in very shallow waters without running aground. The Imagine Angler SUP is the most expensive inflatable board in this review, however we feel the additional fishing features and sturdy construction make it good value for money. The double-side wall rail is constructed of durable PVC which helps ensure the longevity of the board. The price also includes a 3 piece aluminium paddle, high pressure 2-way pump and a carrying bag with wheels which all help to sweeten the deal! BEST FOR: Fishermen looking for a rugged inflatable SUP which can carry up to 450 lbs weight capacity! The Aquaglide Blackfoot Angler 11’0″ is another excellent SUP which has been designed specifically for fishing and includes some neat features such as the six integrated Scotty mounts which enable you to set up directly with your favourite Scotty fishing gear. It also comes with several d-rings and bungee which are ideal for securing fishing tackle, drybags and cooler boxes. The deep-water fin and 36″ width combination results in a stable board with enhanced directional tracking when paddling make it suitable for a range of fishing conditions. We also found the teak style non-slip to be very grippy which again provides extra confidence when fishing from, even in choppy waters. Add in a whopping 450 lbs weight capacity, 150mm thick dropstitch material and a 14 to 18 psi volume (inflated through a single military valve inflation chamber) and you have a solid and rigid inflatable SUP with more than ample capacity to carry all your fishing gear. The Aquaglide also comes with a high-pressure pump with gauge, three carry handles and a vented carrying backpack which makes transporting the board a breeze. If you are looking for a solid board made from high-end materials then the California Board Company 11 foot Angler Fishing SUP could be just the right option for you. 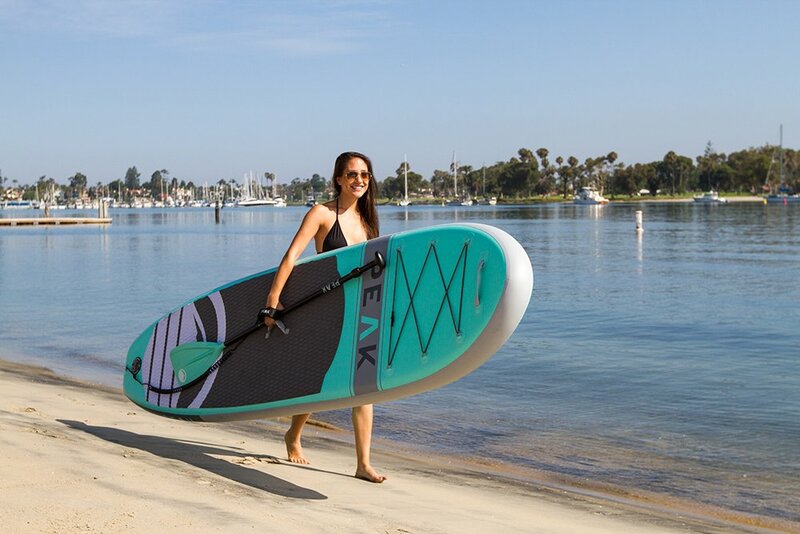 This board is made from 2 layers of fiberglass sheathed in 5 layers of epoxy resin, resulting in an SUP which is both rugged and lightweight offering superior performance. It is suitable for everyone from novices to advanced paddlers, and the v-nose shaped hull design means the board tracks well when paddling. 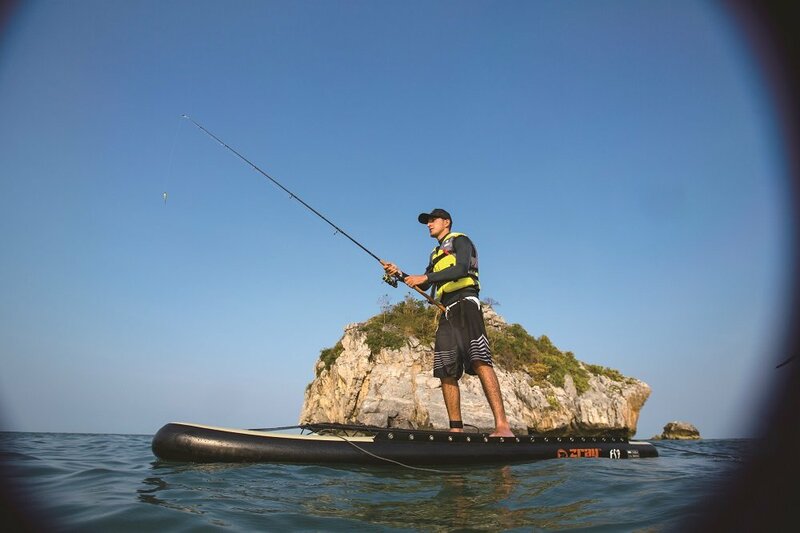 The SUP also comes complete with a gear-rack that can hold two rods, attached bungee at the front and rear of the board, a leash and a built-in carrying handle which makes it ideal for fishing. Measuring 11 foot in length, 30.7 inches in width and with a single fin design, this board is more suited to inland waters although with the unique v-shaped nose we did find it performed surprisingly well in open waters. 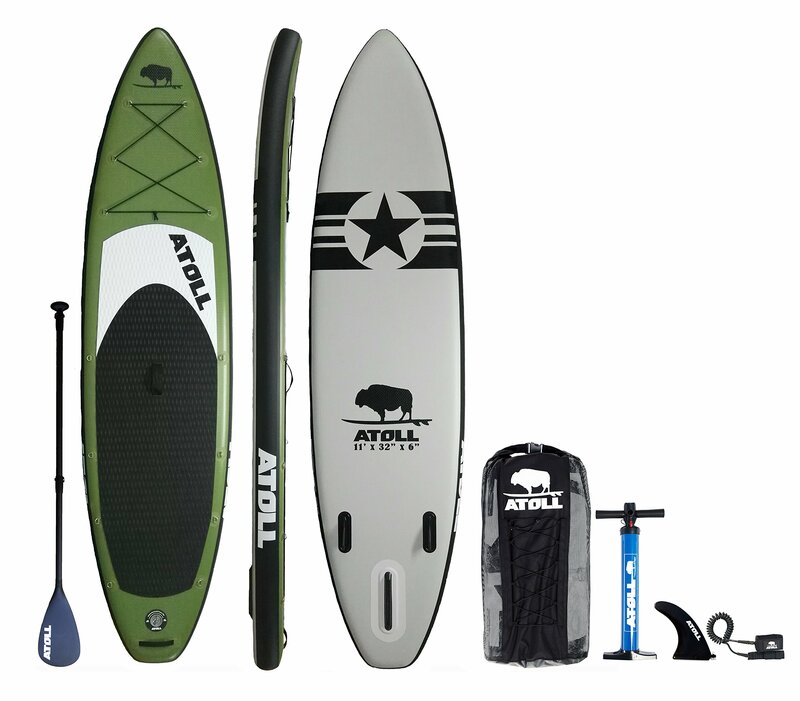 The Atoll SUP is a durable, inflatable board that comes stacked with free accessories including a 3-piece adjustable paddle, pump, repair kit, backpack and tie downs! At 11’0” it offers plenty of space to stow your gear, however with the 32” width and single fin design this board is better suited to calmer waters. Weighing only 19 lbs, this was the lightest board we tested during the review. This comes in really handy if you are someone who likes to transport the board around frequently. The Atoll offers great value for money for fishermen who are looking for an inflatable stand up paddle board for use in sheltered waters. We particularly liked the fact that it includes a 2-year warranty as it shows the manufacturer is confident in their product and provides you with extra peace of mind. Tower boards was formed in 2010 and shot to fame in 2012 when they were featured on the popular show Shark Tank. Billionaire Mark Cuban ended up investing $150,000 dollars and the rest, as they say, is history. Since then Tower have grown an enviable reputation for producing durable, high-quality boards at prices much cheaper than their rivals – thanks to their streamlining of the distribution chain and passing these savings on to customers. The skin of the Tower inflatable stand-up paddle boards (iSUP) are made from an extremely durably military grade fabric. The “Adventurer 2″ is 10’4″ in length, 32″ in width and 6″ in thickness and has a compartively pointed nose shape which makes it better suited to fishing in calmer waters. The 350 lbs weight capacity should be ample for most folks. The package includes 4 D-rings and bungee for strapping your fishing gear to the board and it also comes with a 3-piece adjustable paddle which is suitable for a height range between 4’10” and 6’7.” It also comes with a free pump (although we would recommend upgrading that to an electric pump for convenience) which is capable of infalting the board to the recommended 12 psi. When not in use, it can be easily rolled away (and secured using the supplied strap) to about the size of a sleeping bag which means you can easily transport it by car, boat or plane and it won’t take up too much room in your garage during the winter months either. A Kool fishing cooler with internal storage boxes for bait storage. It also doubles as a seat with comfortable padding and a back rest. Wow, that’s an impressive list of goodies! The only thing missing would be a free paddle but even without it this board is great value for money. Performance wise the Aqua Marina Drift at 10’10” in length, 38″ width and 6″ thickness is very stable although admittedly not the fastest board to paddle. This iSUP is probably best suited to someone who plans to spend longer periods of time fishing at locations which don’t require long paddling time to reach. As with most of the inflatable boards tested here, it is built from double-wall drop stitch military grade material which is extremely durable and should last for many years to come. The Imagine Surf V2 Wizard Angler is an interesting kayak/paddle board hybrid design, packed full of fishing-specific features such as four fishing mounts, two rod holders, a paddle clip to secure your paddle while fishing and two dry storage hatches which can be used to store fish, fishing gear or even your mobile phone and valuables. There is a flip-up seat which can be used to lean against while fishing or as a back support while paddling in a kayak position. We found this really useful especially on windy days where you could reduce the windage significantly by paddling from a sitting position. Measuring 11 foot in length, 35 inches in width and a whopping 8 inches thickness, this board is perfect for fishing, touring, adventure and exploring. It is made from blow molded polyethylene which makes the board super strong however this does come at a price.. Weighing in at an arm-straining 68 lbs this is the heaviest SUP reviewed here which we found challenging if trying to load/unload from the car alone – if there are 2 people to lift the board up/down then this shouldn’t be a problem but it is certainly something to be aware of if you intend to use and transport the board alone. It comes complete with a floating paddle, high pressure pump, a waterproof case as a gift and backpack – all for under $500! Reading through the customer reviews on Amazon, it’s obvious that we’re not alone in being impressed with the Z-Ray and it consistently receives 5-star ratings from customers. Measuring 11’0″ in length, 32″ in width and 6″ in thickness, the Z-Ray is capable of carrying an impressive 330 lbs weight capacity. It’s built with 15 cm drop stitch heavy-duty PVC material and has the quality we would expect from a brand with a stellar 25 years reputation. The 500D tapes on the rail sides were another nice touch to ensure longevity of the board. Once inflated to the recommended 15 psi pressure, we found the Z-Ray to be a very rigid board for an inflatable. 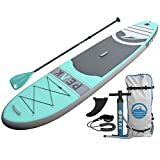 Another excellent fishing SUP for under $500, the Isle Peak iSUP is a great all-rounder which comes complete with a carbon fibre paddle, carry backpack, leash and pump included. Measuring 10’6″ in length, 31′ in width and designed with a single fin, the Isle Peak iSUP is more suited to fishing in lakes or rivers than the open sea or choppy waters. 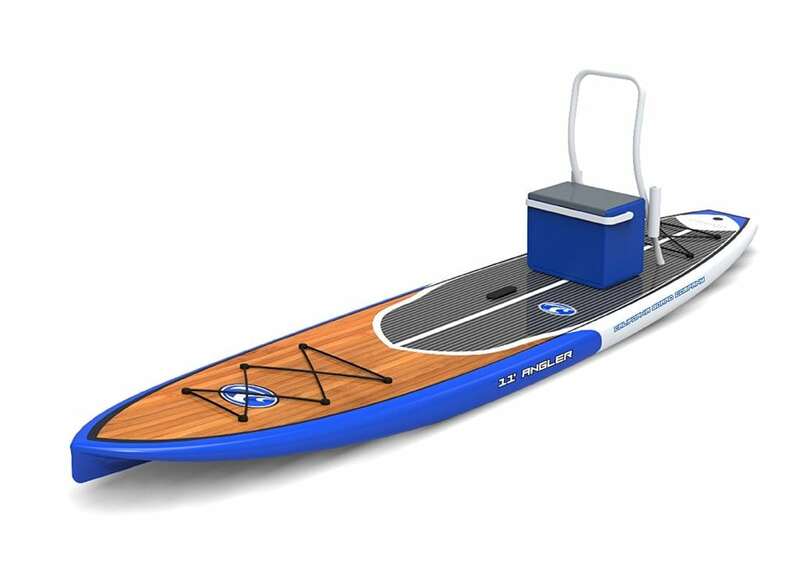 This board would make a great first SUP for the family allowing your children to learn how to paddle board while providing something which is still suitable for fishing for parents. With a 300lbs weight capacity the board dis more than capable of carrying more than one person, or your dog can happily accompany you! It is made from military-grade PVC and drop stitch material for extreme durability, however there have been a few instances of leaking stitches reported so that is something to bear in mind. We should highlight that on those rare occasions where the stitching was leaking air, Isle Peak were very responsive in replacing the faulty boards. 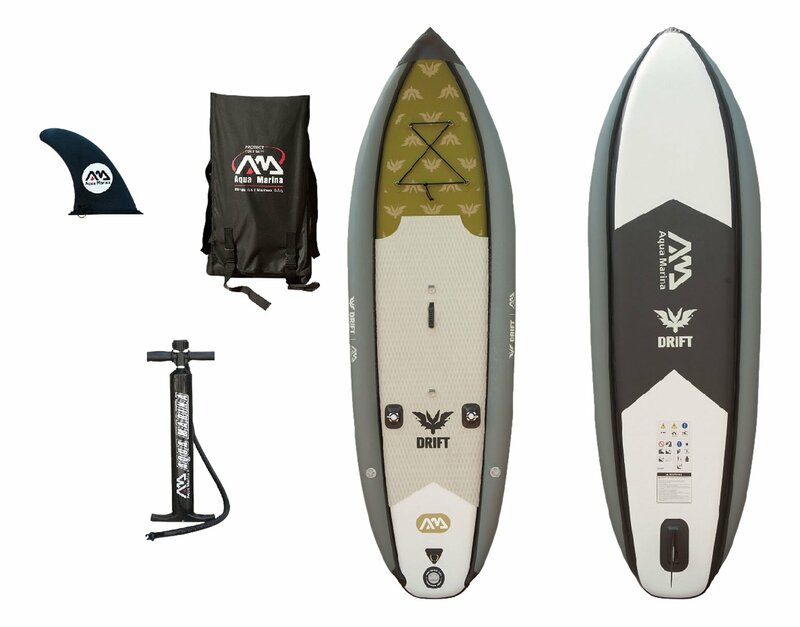 This iSUP comes fully equipped with everything you need to get on the water, all for under $500! 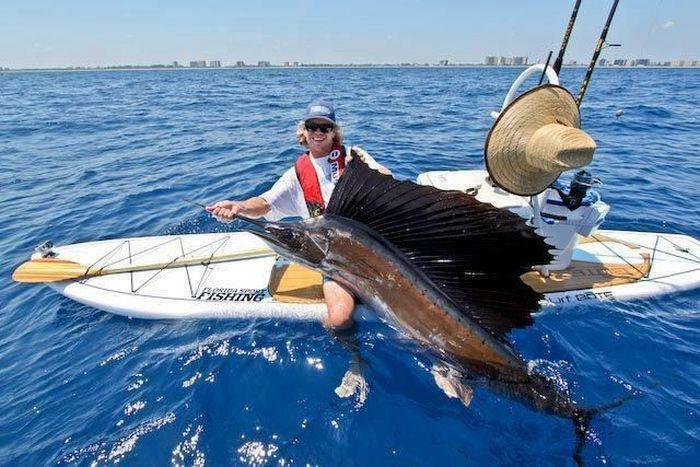 Casting from or landing a big fish on a stand up paddle board can be tricky unless you are a very experienced stand-up paddle boarder or surfer. A suitable SUP for fishing needs more stability than you would expect from a standard stand up paddle board. The most suitable SUP type is a fishing-specific design or alternatively you may want to consider an all-purpose board which can also be used for yoga and other activities. Avoid touring or surf SUPs because they tend to be too narrow, short and unstable for fishing. The exact requirements will depend on your personal needs as well as a budget (which I discuss in detail below) however a great fishing SUP should as a minimum be at least 10 feet in length, 30 inches wide and have a rounded nose shape for improved stability. 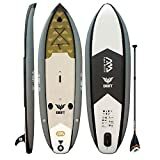 #1 Board Type – one important decision that I recommend you make early when looking for a fishing SUP is whether you prefer a “solid” or “inflatable” board. Both have their strengths and weaknesses and ultimately the decision will come down to your personal preference and requirements. Inflatable SUPs are lighter, much easier to transport and generally cheaper than solid boards. They are typically made from high-quality PVC and once properly inflated provide a rigid platform to fish from. Solid boards are typically made from foam or polyurethane cores with a plastic or fibreglass outer. While they are heavier, more expensive and difficult to transport, they are typically sturdier than an inflatable board. Length: A longer board provides a more stable board and additional deck space for stowing your fishing gear, while still leaving enough room to move around freely. The optimal length for a fishing SUP typically ranges from 10 to 12 foot. Width: A board of 30 inches or wider will provide a stable platform for you to fish from, without rocking around and making waves unnecessarily as this could disturb the fish. Thickness: A thicker board will have more freeboard meaning that the SUP sits higher out of the water which helps to keep your feet dry while paddling and is more comfortable in choppy waters. I would recommend a board thickness of 6 to 8 inches. Volume: The combination of length, width, thickness and board shape will combine to give the board a certain volume, typically measured in litres. Most of the volumes are given for the SUPs reviewed here, for those which are not you can use this calculator to work out the volume. #3 Storage Capacity – storage capacity is an important consideration when choosing a fishing SUP. As a minimum, you will want some deck tie points and bungy for tying down tackle boxes. Some fishing-specific SUPs also include a seat, built-in cooler boxes, dedicated tackle area, paddle and rod holders which are useful additions particularly in choppy waters. Triple Fin: A triple fin design typically has a larger (often detachable) centre fin and 2 smaller outer fins which are designed to speed up the flow of the water giving you increased control at higher speeds. The triple fin setup is best suited for more open waters conditions. 1. Water Conditions – the ideal SUP for fishing in narrow meandering rivers will not be the same as one which is optimal for fishing in choppy seas. Think about which location(s) you intend to fish before choosing your preferred model so that you find a board which has the correct stability and manoeuvrability for the expected weather conditions. Calm Waters: if you know you will be fishing in calm waters a board of 10’ to 11’ length should suffice and a single fin will provide minimum drag and greater manoeuvrability in restricted spaces such as narrow winding rivers. You will also most likely opt for an inflatable board which is easily transportable and more than ample for the expected conditions. Choppy Waters: for fishing in choppy waters or open seas I would recommend choosing a board which is 11’ to 12’ in length, has at least 6” thickness and a width of 35” or more. A solid board will also provide a more rigid and stable platform to fish from in these conditions. You will also be looking for secure mountings to tie all your gear down. 2. 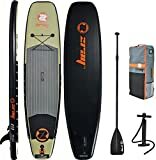 Number of Users – most of the time you will likely be fishing alone on your new SUP, however there may be times when you would like to bring a child/friend with you in which case you should look for a board with maximum deck space (e.g. ideally 14’ in length and 35” or wider), a high weight capacity and good grip as the other person moving may inadvertently throw you off balance. 3. Weight Capacity – you should select a board which has ample weight capacity to carry you plus fishing gear and, of course, all the fish you are going to catch! There is nothing worse than having a board which is heavily laden and lacking buoyancy to carry its load. 4. Experience Level – when referring to experience level I am talking about your experience as a surfer/paddle boarder as well as your experience level as a fisherman. A more experienced paddle board user can get away with a narrow, less stable board to gain paddling efficiencies. Similarly, someone fishing on their local lake for small trout will have very different requirements than a person who plans to use their fishing SUP to catch large predatory fish such as tuna or marlin! 5. Budget – Ultimately budget will always be an important consideration when choosing your fishing SUP, hence why I have divided this article into 3 distinct price categories to help you identify the differences offered in the various price ranges and to find a more that meets your requirements and budget. Grip / traction pads: most SUPs come with grip or padding on the board. You should look check that the grip covers enough area of the deck to allow you to stand comfortably and provide a non-slip surface for securing your fishing gear and cooler too. Paddle: Obviously this is an item which you must have, so even better if it is included as part of the package. You should look at the type of material it is manufactured from (e.g. wood, plastic, carbon fiber or aluminium) and also check that the length is suitable for your height. As a rule of thumb, the correct paddle size for you should be your height plus 9 to 10 inches i.e. if you’re 6’0” you should choose a paddle which is between 6’9” and 6’10” in length. Paddle holder: Most paddles do not float and even if they do, trying to secure them while fishing can be troublesome. A paddle holder is a great feature to take away the distraction of looking after your paddle while you are fishing. Seat: I admit this is a bit ironic to add to the list for a “stand-up” paddle board but if you intend to fish for long periods of time then having a seat can be a blessing. Look for one with a comfortable pad for maximum comfort. Leash: A leash is a secure line which is wrapped around your ankle and attached to the board. It can provide added comfort in rough water conditions or just in case a fish pulls you off the board so there is no risk of the board drifting out of your reach and leaving you stranded. Pump: Required for inflatable boards and should usually be included. Rod holders: A useful fishing specific feature particularly if you want to fish multiple lines simultaneously. Tackle box and/or gear bag: You will need a place to carry all your tackle, having a tackle box or gear bag which can be securely mounted to your board is ideal. In this article we have looked at the 10 Best Fishing SUPs on the market today, including looking at the design, specifications, fishing specific features as well as the pros and cons of each board to help you decide which is the best fishing SUP for your needs. Best Fishing SUP Under $1500 – the new 12 foot “Cross Fish” BIC rigid stand up paddle board was the winner in this category. We really liked the longer length of the board, keeled nose design which helps the board track more accurately when paddling and the range of fishing specific features which are incorporated into the package. It also comes with a 3-piece adjustable paddle, pum repair kit, backpack and tie-downs included, making this a great buy for the price. 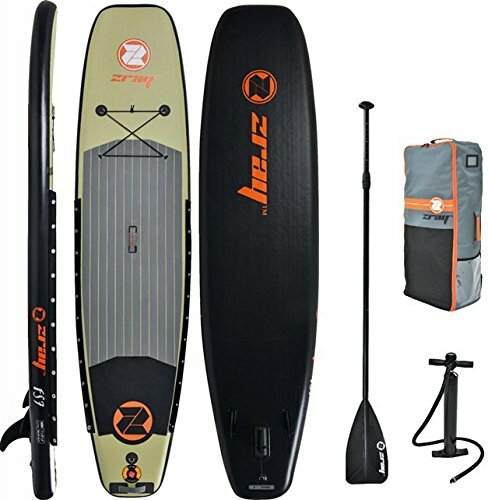 Best Fishing SUP Under $500 – the Z-Ray 11 foot inflatable fishing SUP was a stand-out performer in this category. It has some unqiue design features including a square-shaped nose and triple fin design, both of which work really well together to offer a great performing board. It also comes complete with a floating paddle, backpack and high pressure pump making this a fantastic buy for under $500! We hope you have found this article useful and would love to hear from you on which fishing SUP is your favourite. 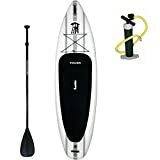 If you would like to purchase one of the fishing stand up paddle boards reviewed here, you can do so by clicking any of the links above. Placing your order through these links won’t cost you anything and helps us to cover the server costs for the website without the need for annoying pop-up links. Thanks again for taking the time to visit sporting-outdoors.com today! Wow, this article really goes into depth explaining what to look out for when buying a fishing SUP. I feel much here equipped now to choose the right board for me. Thanks! Great to hear you enjoyed the article Steve and found it useful. Keep us posted on your fishing SUP adventures!